OK OK, maybe calling gold a “dog” is a little much, and yes you’d be write to point out that against euros and pounds it’s doing quite well. But considering the wild-eyed predictions we heard only a few months ago, and the fact that it really hasn’t gone anywhere in dollars in ages, gold does feel like dead money for now. So why hasn’t it lived up to the hype? Maybe it’s just a matter of — gasp — supply and demand. 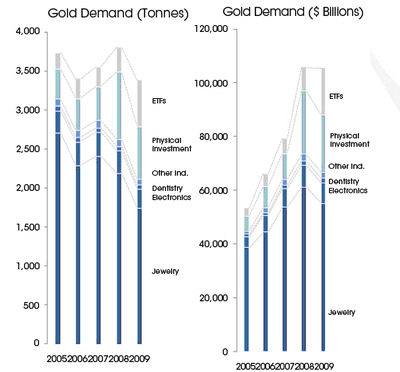 Here are a couple of charts from Julian Murdoch at The Bullion Vault which may tell a lot of the story. 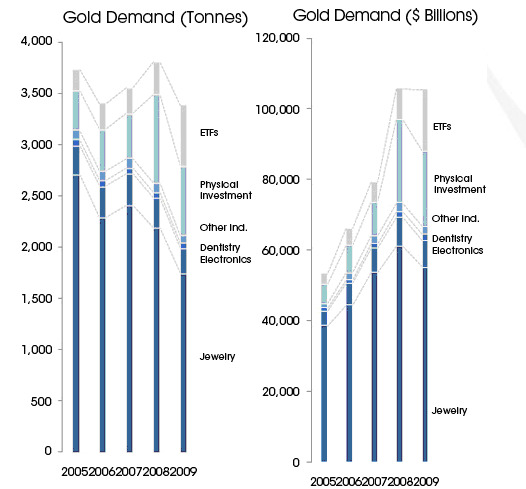 Yes, in terms of tonnage, demand went down, and in dollar terms, gold demand stayed flat from 2008-2009. 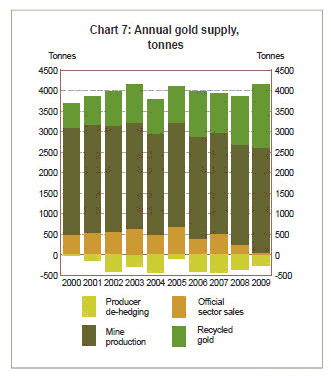 Now here we have the opposite: 11% y-o-y growth, with big gains seen in mind production, recycled gold (Cash4Gold!) and less producer dehedging. So supply’s up and demand’s flat. Any questions?